Solar CPV records broken - but can innovation trump mass manufacture? Records are being broken almost monthly in the concentrated photovoltaic (CPV) solar power market, but at the same time manufacturing plants are being shut down and big players are struggling to compete with their cheaper Chinese counterparts. Elly Earls met CPV analysts Sam Wilkinson and Ed Cahill to find out why driving down costs through incremental innovation could be the only way forward for this struggling sector. Amonix is one of the main players in the CPV solar power system market. One of the key disadvantages of CPV is that it is extremely material intensive with its glass, thick modules and large tracking systems. CPV suppliers also face the challenge that there are very few existing CPV systems in the ground to prove the viability of the technology. Sam Wilkinson is a senior analyst within the PV group. During his time working within the group, Sam has been heavily involved in researching the polysilicon to module supply chain, working closely with leading global suppliers to develop detailed research on these markets. Ed works with companies to provide insight into the future technologies, policies and strategies that will be essential for success in the burgeoning solar industry. In October 2012, Amonix, one of the main players in the CPV solar power system market, recorded an outdoor operating efficiency rating of 33.5% for a photovoltaic module, breaking the previous world record of 30.3%, also held by the US-based company. In the same month, Silicon Valley-based solar energy company Solar Junction, which develops high efficiency multijunction cells for the CPV market, achieved 44% cell efficiency, again breaking its own world record. Efficiency is clearly on the up, and this has led several research companies, including Lux Research and IMS Research, to predict significant growth for the CPV market during the coming years. While Lux Research believes the market will be worth $1.6bn and will have reached installed capacity of just less than 700MW by 2017, thanks to a 31% compound annual growth rate, IMS Research expects even greater growth. By 2016, according to the company’s latest report, CPV installations will be at almost 1.2GW. "Several research companies, including Lux Research and IMS Research, predict significant growth for the CPV market." So, what’s the appeal of CPV over its much more established counterpart, plain old photovoltaics (PV)? Mainly, it’s much more efficient. 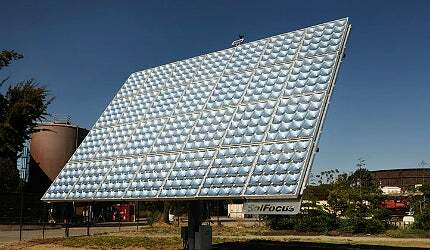 CPV technology utilises optical lenses to precisely focus and concentrate direct sunlight onto a set of PV cells mounted on trackers, which follow the position of the sun. The PV cells used are usually multijunction cells, which were originally developed by Nasa and have higher energy conversion efficiency than even the highest efficiency silicon PV cells. "CPV has some significant niche value, in the fact that it’s highly efficient and produces power later in the day thanks to dual axis tracking," confirmed Ed Cahill, research associate at Lux Research. Unfortunately, the technology also has its disadvantages. Not only are the up-front costs of installing CPV systems much higher than for PV systems, it can also only be used in high direct normal irradiance (DNI) environments, which severely limits its scope for widespread use. Moreover, big US and Europe-based players are struggling to compete with lower cost manufacturers in the East and demand for CPV in the US has been lower than anticipated. This has meant that many companies in the sector have struggled to make profits, and some have even struggled to stay afloat. Amonix, for example, the supposed leader in the CPV niche, was forced to restructure earlier this year, shutting down its manufacturing centre in north Las Vegas, because of intense competition from low-cost Chinese competition, the challenging solar energy equipment pricing environment and lower than anticipated demand for CPV solar energy in the south-west US. Yet, all of these factors have been taken into account by industry analysts at Lux and IMS, and they still believe significant growth is on the cards – if costs can be driven down. "CPV technology utilises optical lenses to precisely focus and concentrate direct sunlight on a set of PV cells mounted on trackers." "It’s absolutely essential for CPV companies to drive down costs; there’s a lot of over-supply in the market, which means even the most successful companies are losing tens of millions of dollars each quarter. Fortunately, there is a lot of potential to reduce costs," Cahill noted. Sam Wilkinson, senior research analyst at IMS Research and co-author of the company’s recent report on the CPV sector, agreed. Indeed, the report predicted that the cost of CPV systems will decline on average by 16% each year until 2016, at the same time that leading suppliers will make major technological advancements that will help make CPV more attractive in a number of markets. For both analysts, innovation will be absolutely key to growth – but not all at once. "You always hear about new start-ups that have really wild ideas, such as Cool Earth Solar, which uses an inflatable plastic film that can concentrate light," Cahill said. "I hope they have a lot of success, but in reality the CPV market needs smaller step, more gradual innovations if it’s going to be competitive." One of the key disadvantages of CPV is that it is extremely material intensive with its glass, thick modules and large tracking systems. So, for Cahill, the most useful innovations would be things like thinner lenses, which could reduce material costs, or anti-reflective or self-cleaning module coatings. Standardisation is another potential way forward for the industry. "If you standardise components between all the CPV companies, it means component manufacturers can scale up and reduce the costs of those components," Cahill explained. "The most useful innovations would be things like thinner lenses, which could reduce material costs." "With economies of scale, costs can be driven down significantly," Wilkinson agreed. "Moreover, many suppliers are getting around cost issues by outsourcing their manufacturing to places such as China." But it is by improving efficiency that the biggest strides will be made in the CPV sector; multitraction cells are always advancing and players like Solar Junction and Amonix are improving their efficiency month on month. While this does not decrease the up-front costs of the technology, it will, eventually, significantly decrease the levelised cost of electricity (LCOE), which, for both Wilkinson and Cahill is key to the sector. "Our analysis shows that the LCOE is not currently lower than PV, but we expect it to be by 2017," Cahill noted. "And that’s when you really start to get to that nice little niche and CPV companies can comfortably have the market share that they need." "One of the main things suppliers are focusing on is increasing the efficiency of their cells, which will increase the efficiency of CPV systems overall," Wilkinson added. "There’s also room to increase the efficiency of the optics and the mirrors they use to concentrate light onto the cells. The average is currently about 75-80% efficiency, so there’s lots of room for improvement." However, there are a few other factors standing in the way of CPV’s growth – not least the technology’s perceived lack of ‘bankability’. "Many people still see it as a new and under-funded technology, and therefore believe it to be less bankable," Wilkinson remarked. "Many companies in the sector have struggled to make profits, and some have even struggled to stay afloat." Moreover, CPV suppliers also face the challenge that there are very few existing CPV systems in the ground to prove the viability of the technology. But, again, there are ways to improve this perception; for Wilkinson, the best way to do this is through pilot schemes. "These are extremely important in improving the perception of CPV," she emphasised, adding that Soitec, a leading manufacturer and supplier of CPV systems, is a great example. "The company had a small pilot system in South Africa very close to where they now have a PPA signed with Eskom for a 44MW system." CPV will never reach the scale of its more conventional counterpart, PV, but, despite the difficulties the sector is currently facing, there is little doubt in the minds of industry experts that growth is still very much on the cards. And if small step innovation continues, standardisation is implemented and cell efficiency carries on improving, there’s no reason why – despite low-cost competition – CPV shouldn’t have a small, but profitable, piece of the solar energy market in the next five years. The US and EU are on the brink of a full-on trade war with China over the alleged ‘dumping’ of cheap solar panels. Denmark plans to run its entire energy system on renewable energy by 2050, with wind as its main power source.